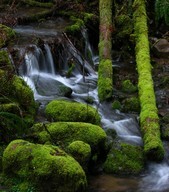 As Mother Nature moves water, she sends it twisting and turning its way through streams of gravel and rocks. This natural churning and vortex activity serves to balance and structure the water molecules for optimal absorption and health benefits. Initially structured water is free of memory. It has a balanced pH. The main contingent of structured water is life force energy and that life force energy comes down to the water molecule itself. The water molecule has the power to protect life. Meaning, it protects your body from the things that are adverse to life and to generously provide the things that are good for life. The way it does this amazing process is to pull things such as chemicals that are adverse to life to the inside of the water’s molecule and then removes it from the body through elimination. Simple…right? In other words, structured water molecules grab onto pollutants, chemicals and anything else that is not part of a healthy body environment and flushes it out of your system. The water molecules are loosely attached to each other through hydrogen bonding. These water molecules will cluster in groups. They will switch from one group to another very easily. Hydrogen bonds are being made and broken several times a nanosecond. 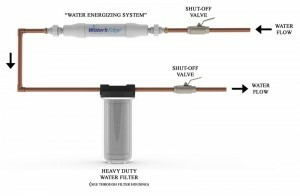 This creates a dynamic energy environment of water. It is the size and shape of these clusters of molecules in their never ceasing interaction that is the “structure” of water. The Water’s Edge Structured Water System is a multiple vortex system to mimic a river or stream in nature. It makes the water spin in both directions simultaneously at multiple times. That aspect of vortexing has a great attribute to fixing water, fixing pollution. Water leaving the unit is “programmed and structured” for maximum benefit. We highly recommend watching the video documentary, Water – The Great Mystery to learn about structured water from leading scientist around the world. Click on the picture right to check it out. 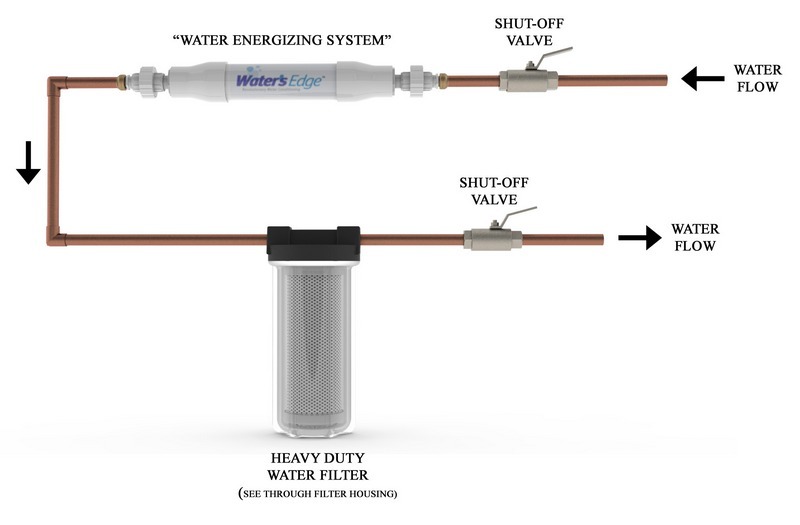 One system supplies structured water to your whole house. Everything takes less water when it’s structured. About 30% less water. Set your automatic sprinkler system 30% less time to water for a lush lawn. Your beautiful veggie garden will take up to 30% less water to hydrate your plants and the soil. Therefore providing 30% larger yields when it comes time to harvest. And what about those flower gardens? Same thing. Up to 30% bigger blooms, bigger plants. Your plants will actually be hydrated so they can survive the summer heat and the winter cold better. In everybody’s homes you have items that you have to constantly maintain. With the Water’s Edge System you buy it one time. You install it once and it will never wear out. It has no moving parts. You can, if you wish, remove it and take it with you if you move, or let it stay with the home you are selling and leave it as a special feature. The water itself is the moving part of the unit. It is what brings the water to that place of being free to do what it’s meant to do. Make your life absolutely perfect. Because what are you? You are around 80% water. As we age that percentage of water drops. But if you are drinking structured water chances are you will maintain good hydration and not loose it as you age. 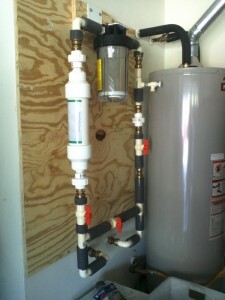 Once installed, all the water that passes through the pipes will be structured. And it will go into all the pipes in your house, cleaning them as it goes. It moves through your water heater, washing machine, dish washer, showers, baths, including your sprinkler system, and any outdoor use you can find for water…it will be structured water. In addition, it will go to everything you consume, like coffee, tea, a pot to boil spaghetti, or just drinking a great tasting glass of water from your tap! Now that doesn’t happen everyday! Now, think about your bath and shower. Structured water is better for your body, because your body is the largest organ you have and in a shower or bath your body is absorbing the water and it might as well be the best structured water on the planet. Your water will go down the drain, and back into the sewers. If it’s in a city it will go back into the processing system and will enhance their system. If everyone were to use structured water we could help clean up the pipes in our city’s water system. This would save the cities in our country some serious money. Giving the city better water than you received would be the end result! One thing that may happen is your water heater will begin to release all the sediment that’s built up, all the aggregates, the calcium build-up and it will drop to the bottom. So you may find a need to flush it out in order to eliminate the build up. This completely depends on the age of your water heater, of course. Your ice machine, your gardens, your plants, your animals, your swamp cooler, everything is provided with structured water. It removes the things that are bad for life. Chlorine is bad for life. Fluoride is bad for life. Toxins are bad for life. Structured Water will detoxify your body. Structured water only pulls things from the body that detrimental to life. It gives freely all the things that are good for life. Distilled water, RO (reverse osmosis) water is hungry water. It has no discerning power, nothing to discern what is good and what is bad. It takes it all. The neat thing about structured water is it’s balanced. It’s absolutely pH balanced. And it’s the balance of nature that brings us to that place of doing what we are meant to do. Being what we are meant to be. Being in joy. When we all come together and we are all in joy and we are doing what we are meant to do then it will be just like a river, we will be in the flow. Structured Water has memory. Memory is an attribute of water that potentially takes it back to whence it came, convoluted. The only way to correct this condition is for water to return back to its natural origin and then re-emerge to again blossom into its freedom to do what it is meant to accomplish. Now we do have a solution to this re-emergence of life force energy; Nature’s Hydration Structured Water. Structured water will remain structured 7 to 10 days in direct sun light. In the confines of your home barring any of the forgoing conditions, up to 30 to 60 days and even longer as we become more in tune with being structured ourselves. Other ways to extend this order are to place the water in cobalt blue containers this keeps the water shielded from the effects of the outside world. Use sodium bentonite clay containers, glass or stainless steel for best results. Plastic bottles may leach into the water and add toxins to your body and is unfriendly to your environment.